South Australian Attorney-General John Rau has proposed dropping the MA15+ game rating entirely if an R18+ rating is adopted, saying he wants to "force game manufacturers to make a decision about who they are marketing to." When John Rau replaced Michael Atkinson as Attorney-General of South Australia, gamers heaved a sigh of relief. With the chief opponent of an R18+ rating out of the way, the common belief seemed to be that Australians would soon be playing the same grown-up videogames as everyone else. If was a bit of a nasty shock for some, then, when that didn't happen, but at least Rau is taking part in discussions on the matter rather than dismissing the idea outright. He also put forth one of the more interesting ideas to come out of those discussions: dropping Australia's current MA15+ game rating in order to more clearly define the line between games meant for kids and those aimed at adults. "My reason for wanting to get rid of MA15+ if an R18+ is passed is that it will provide a crisper delineation between adults-only games and games that are for children," Rau told GameSpot. "I want to force game manufactures to make a decision about who they are marketing to: if it is adults, their games will be rated R18+; if it is children, then they will have to ensure that their games are sufficiently pruned back to make it into the M category. The whole point of this is to force manufacturers to make a choice in their own heads: are they marketing to kids or to adults?" The M rating in Australia is essentially the same as the ESRB's T rating in North America, which means that a game may contain some intense bits but is still okay for the youngsters. MA15+, on the other hand, is a "bridging category" which Rau said could be exploited and ultimately confuse the question of what's appropriate for kids and what isn't. "Look, I know we're not creating a watertight situation here; we never will," he admitted. "But I think it is our job to influence what is going on at the retail level and support responsible parents in their decision-making. [Federal Minister for Home Affairs] Brendan O'Connor wants to reclassify MA15+ games for exactly the same reason that I want to abolish the MA15+ category altogether: namely that MA15+ is a dangerous classification. I'm willing to consider what is being put on the table of course, but my bottom line is that I don't want there to be a seamless continuum from G to R18+. I'd like to see a big gap between the M classification and the R18+ classification should it be introduced." It's an unusual idea but I think it's a good one, because it puts the onus on parents by simplifying the question of what is and isn't suitable for their kids. It also makes life easier for game makers by removing the gray area they often shoot for in order to maximize their audiences or, in the case of Australia, to get their games on the shelf in the first place. 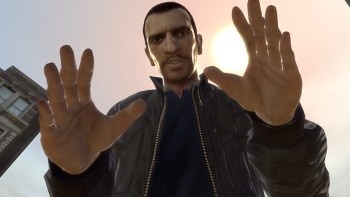 The fact that Grand Theft Auto IV is rated MA15+ is not only evidence of the overall dysfunction of the Australian rating system but also of the "danger" Rau spoke of. Any rating that can make a game that's obviously not for kids look like it is, is not a system that's of any value to anyone. The next meeting of Australia's Standing Committee of Attorneys-General is scheduled for March 2011.